This photograph of Thornaby Airfield in 1958 reminded me of a visit to an airshow there with my father in the 1950s. Two thing stick in my mind about that day out, the first was standing under the open bomb doors of an airplane and looking up at the racks, it seemed to me to be a huge space, it was about the same size as my mothers living room, the second thing was watching a jet plane taxiing along the runway, as it reached the end it turned ready for take off, the runway was edged in cinders and the crowd, myself included, was treated to a shot blasting session as the exhaust pointed toward us. Another thing I remember at an airshow was an English Electric Lightning doing a fly past and going into a vertical climb and we were looking straight up its exhaust, I am not certain this was at Thornaby as I have been to many airshows over the years, does anybody know if a Lightning ever flew at Thornaby around about 1956. I have no idea what type of plane this is in the photograph but I am sure somebody will know. 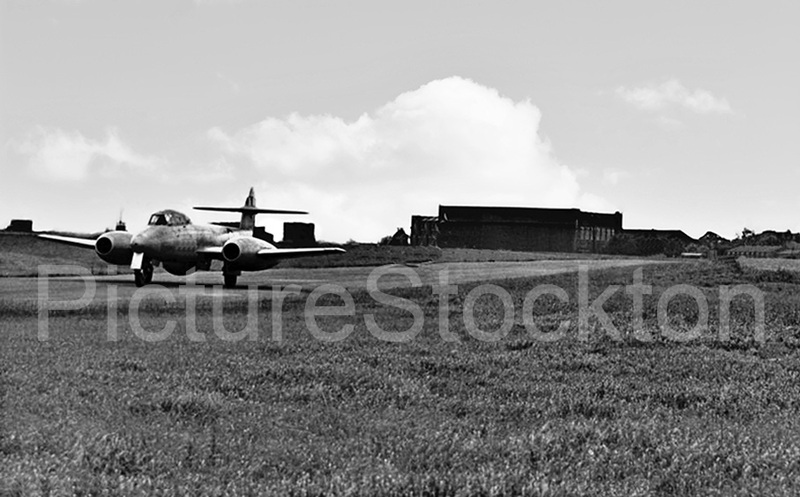 Definitely a Gloster Meteor TMk7 taxying for take-off and approaching that concrete building some say used as a gunnery position.However on a scale drawing I have of the airfield it is indicated as a battery housing? I, like many young lads I would stand around; and on top of this building watching the aircraft. The last time I was there one beautiful summer evening in 1958 when I heard the familiar sound of jet aircraft starting up from my home in Barker road.I raced up to the pillbox, and there was 92 squadron with their wonderful Hawker Hunter Mk 6’s. The sun setting made the olive green and grey camouflage with the red and yellow chequered squadron markings, stand out for an unforgettable experience.As many people will know 92 squadron used RAF Thornaby for a short period whilst the runways at RAF Middleton St George were being extended to accommodate the E.E Lightnings. I became a member of 1261 ATC Squadron in 1959 based at RAF Thornaby. Just to point out to Anon that The American Super Sabre F100 and the Russian Mig 19, both of which were supersonic designs and at least 100 mph faster than the Hunter were entering service at the same time as the latter. Fred it’s the old argument about fastest, most agile etc. The Hunter had a top speed of 715 m.p.h. at sea level. The Super sabre 864 at 35,000 ft. the Mig 19 902 at the same altitude but at lower levels, at which most dog fights take place these speeds decreased. In the Falklands the Mirages and their copies the Kfirs found that the slower Harriers were more agile and almost as fast at low levels. Also few dogfights take place at supersonic speeds. It’s the old hot chestnut as to which was the “best fighter”, it depends on who is telling the tale, the victor or the loser. Interesting argument forgetting training comes into the picture. A British Naval Sea Fury shot down a MIG 15 and possibly another, Piston engine against Jet. 4 British planes attacked by 8 Migs which came out of the sun firing, the Furies turned into them and Commander Carmichael went head on to a Mig badly damaging it and another before the Migs ran for home. That was Korea 1952 and a War I remember well as I was on Barrie Docks in Wales waiting to ship out to Pusan, it was cancelled at the last minute as Pusan was surrounded and they wanted foot soldiers not engineers. There is much talk about technology in war but those of us in the forces after the war knew it was fragile and came down to being able to overcome its faults often using sticking plaster and safety pins or in our case using wine bottle corks in tank hydraulic systems. Nothing is infallible it is often up to the tenacity of people to overcome problems. However we were years ahead in jet airliner design where unfortunately metal fatigue caused the redesign of the Comet and allowed the US to glean information leading to the Boeing 707. Again we did the hard work with a lack of money and the rest of the world benefitted. It is a Mk 8 Gloster Meteor, possibly the one I saw doing the high speed runs. It was the last day fighter version of the Meteor, and was the first indication that Britain was falling behind the Americans and Russians, who were flying the swept wing F86 Sabre and Mig 15. It had lost a slight step to those two yes (the Mig powered by a British-supplied RR jet engine design licence-built by the Soviets- oops), however at that point (1950) The Swift and Hunter were already in development and/or production, the Hawker Hunter outclassing the contemporary Migs and Sabres and along with the Supermarine Swift, setting unmodified world speed records. It looks like a Gloucester Meteor. I seem to remember one of the displays starting with “High Speed Runs in the Meteor 8” it was raining at the time and someone commented that the pilot could not have seen a thing. It all seemed very tame compared to the finale of the show, the near supersonic flypasts by the Hawker Hunter, but the efforts by the Meteor were dangerous. At just above its top speed of about 590mph the aircraft became nose heavy, tending to put the aircraft into a dive. It looks like a Meteor to me I was born educated and grew up in Thornaby and used to watch the aircraft on a regular basis from many vantage points, great days. I was in them RAF in 1950’s – the national rail strike caused chaos – service personnel stranded ordered to report to nearest RAF base – mine was RAF Thornaby – hundreds of men from RAF bases all,over the country stood in lines as lorries rolled up. Sure that’s why Dr Beeching used his axe on Railways. Around that time a squadron of NF18s had been there. A mock flying. Bed stead was there… ’57? No Lightning… A Sabre & Canberra. 608 was THE club!!! Think the aircraft is a meteor. I believe the aeroplane in the photograph is a Gloster Meteor. I have a picture of myself standing (I was only 7 years old) in the cockpit of an English Electric Lightning at an airshow circa 1959 at what is now Durham Tees Valley Airport. I still remember it flying the length of the runway but only 100ft above it. Lightnings were base at Middleton St George and we used to watch them do that vertical climb from our house in Worsall near Yarm. My father taught me drive on Thornaby airdrome in the latter part of the 1950’s in an Austin A70 then one of the first Hillman Minx’s – HFW 58. Good times!! !